We are a mainstream, inclusive school that fully complies with the requirements outlined in the Special Educational Needs Code of Practice (2014). At Danetree primary School we recognise that the quality of teaching within the classroom has the greatest influence over children’s progress. We therefore invest in training, resources and monitoring to ensure our classrooms are an inclusive place for all children. This is known as the ‘Wave 1’ or ‘Quality First Teaching’ level. Additional interventions at ‘Wave 2’ are planned to enable children to accelerate their progress and work at, or above the expectations for their age. These are generally taught in a small group and sometimes a 1:1 situation. Interventions run for 10 weeks and are reviewed as part of the school’s Pupil Progress structure. 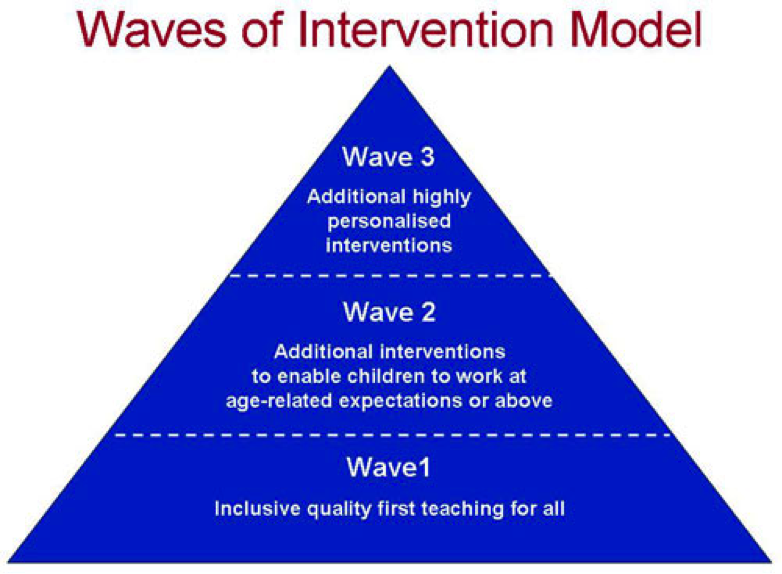 A child identified as having SEND also receives ‘Wave 3’ interventions. These may be provided individually or in a small group, and the support provided is personalised to enable the child to achieve his/her potential. This support is additional to or different from the everyday curriculum for that class and is detailed in an Individual Support Plan (ISP). This plan is prepared by the class teacher, overseen by the SENDCO and is reviewed termly. It may also include provision/ advice from an external agency or professional, such as a Speech and Language therapist. If you have further questions with regards to our SEN provision, please contact Mrs Dawn Prosser (SENDCO) via the School Office. For a copy of the SEND policy, please refer to the policy section of this website. We trust this information report below, together with our SEN leaflet and policy, provides you with a flavour of our inclusive approach at Danetree Primary School.